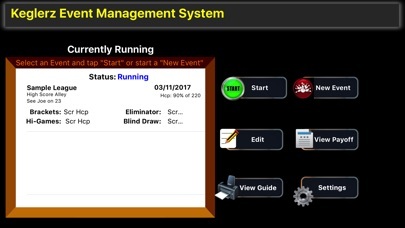 The Keglerz Event Management System is an innovative way to manage Bowling tournaments, brackets, high-game pots (Nassau’s), Blind-draw doubles and eliminators in both tournaments and leagues. Standard 3 game leagues all the way through tournaments up to 6 games are supported. So if you run tournaments or side-pots in your leagues, this is the app you have been waiting for. For the first time, tournament organizers and league members who run side pots, no longer have to carry around a computer or use paper and cards to run their events. Now using an iPad or iPhone, organizers have the mobility to quickly and effectively run these events all in one unified system. Entering scores on the fly and updating all the side-pots in one contained package. What makes this system unique is with its use of client-server technology. 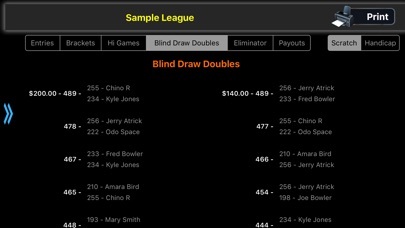 With our free companion smartphone app, SidePots, bowlers in the events can view the side pots and their standings in real-time instead of waiting for print-outs and gathering around tables and walls to find our how they are doing in the event and sidepots. Bowlers can also help the co-ordinator by entering their own and nearby scores. I. Requirements. In order to run the Keglerz EMS, you must have the following: 1.	iPad or iPhone running IOS 9.3 or better. 2. Live Internet Connection OPTIONAL 1. AirPrint compatible printer to print standing/tournament/league sheets. This app is amazing. I have been using it for over a year now for my tournaments and it’s so easy and convenient. I’ve bowled handicap events, scratch events, and one professional (regional) event. In all three, T-BRAC was used to run the tourney, get brackets done, etc. I’ve recently tried running a tourney with Keglerz. Like a reviewer before me, I like the ease of use, especially with entering scores. I also like the instant feedback that you get with side pots and tournament rankings - the +/- is a very nice touch that even T-BRAC doesn’t show. But it takes some getting used to. 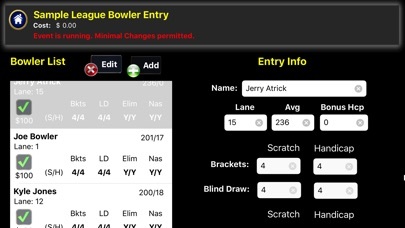 My plan is to run paperless events and see if the bowlers are ok with that. Here in Michigan we’re all used to looking at bracket sheets and finding our names. When I tell them to download sidepotz so they can have a look, that might be met with some blank stares and ‘why don’t you just print them out like everyone else?’ I can, but hopefully not one bracket, one sheet of paper, at a time. 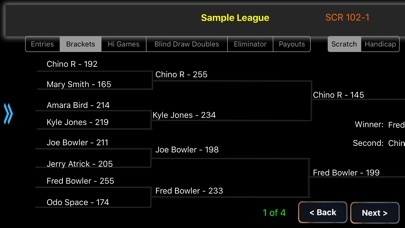 If I run brackets during my league, I don’t want a ton of paper to deal with and still try to bowl. The other issue I’m working through is the ‘pay as you go’ model. With all other tourney software you can make a 1-time investment over $100 or so and the software is yours to build tourneys to your heart’s content. Here, there is a definite investment of $5 per tourney, so the more you run, the more you invest in the program. It costs more to do tourneys with cut scores because you either have to run a whole new instance of Keglerz to handle the bowlers who make the cut, or you do the rest of the tourney on paper to save on using your credits. I’d like to see the ‘cut’ feature used in the eliminator, extend to the entry portion. That way you could enter a cut score similar to the eliminator, and all games after that will have an option of dropping previous pins, or continuing to add pins for those who make the cut. In my usage, the pins would be dropped for games 4 and 5. So everyone else would be eliminated, and you could no longer enter scores for them. Bowlers who make the cut get games 4 and 5 entered, and their scores continue to be tracked. It would make for an interesting programming challenge to put these things in, but even if you don’t, the program is still usable where you have it now. I think it will catch on in a few years, as client/server based tourney programs are going to become popular. The best thing about the program is entering scores... a couple taps and done. I’m improving my rating on this app. It seems there’s a bit of a learning curve. It would be nice, in addition to the online manual, to have a step by step sample from start to finish to follow with detail explanations and screen descriptions with screen shots Raised my rating.... Edit: Now that I’ve had time to work out how it works and with helpful information and responsiveness from the dev. I can honestly give it two thumbs up and FIVE STARS... On a side note don’t use special characters to name you league/tourney like (&) for example. Overall, I like the program and it is wonderfully simple and user-friendly, as long as you don't have any tie games. That is my biggest criticism of the app and the reason it gets 3 stars instead of 5. If there is a tie in a bracket, it advances all three and takes the top two as winners, even if they started out in the same bracket. This is counter to how brackets run on every other type of software. The same goes for side pots. Two 1st place finishers will cause the app to randomly assign one as the winner and the other as second place. Those items really should be fixed. I'd like to see the ability to do blind doubles as a series, or do each game individually and series. This app seems to be AWESOME from testing so far. No crash issues for me. The Keglerz - Remote Access Client app makes this perfect for others to see where they stand without walking to print outs. ISSUE - For some reason in the bracket part ties don't work correctly at all. The game 2 tie breaker doesn't count the scores right and advances things completely wrong. 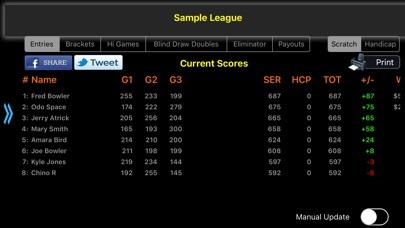 Some how it advanced bowler 8 to the finals vs bowler 8 during my testing. Bowler 1 vs 3/4 (tie breaker) just didn't calculate. Good concept but the app is constantly crashing when I try to check the actually brackets.